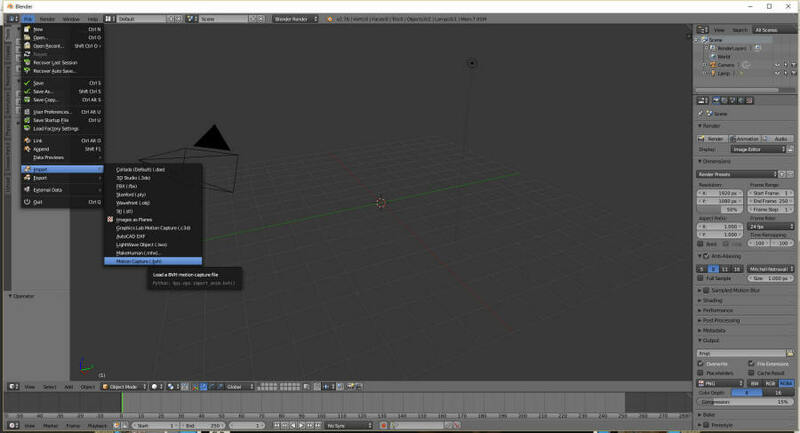 Start Blender and Navigate to the User Preferences Screen. 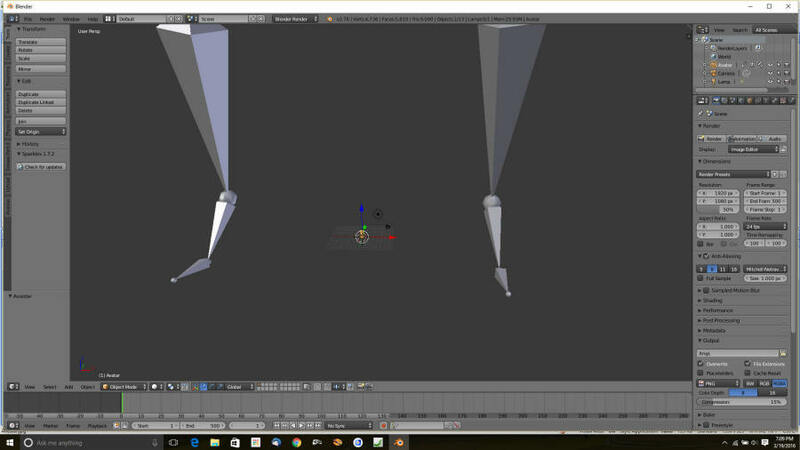 I am using Blender version 2.76 in this demo. Click the Search box and type "BVH". Make sure the Import Export button for BVH files is checked, and click "Save User Settings"
You will need to set the animation Start at "1" in the menu at the bottom. The green line should be at the number 1 when you do this. You can slide the green line with the left mouse, or click the Start: dialog box, and enter the value 1. I am using Avastar 2.0. Your screen may be slightly different here, but it works the same. 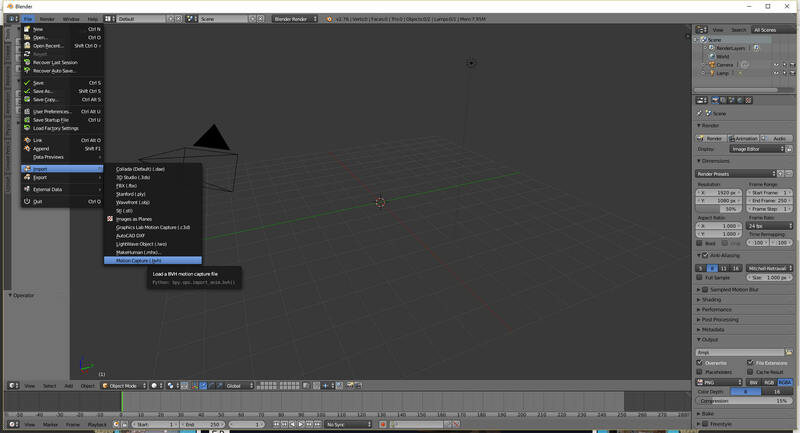 Press Shift-A and select Avastar, and if you have 2.0, select "With Triangles". If you have the "Sparkles Pro" plugin, ,you could choose the Quads version of the Avastar. A very tiny Avastar will appear where the cursor was. Don't panic! It does not really matter where the Avastar is, and the size will be fixed in a few more clicks. Hove the mouse over the 3-D window and press the letter T. A menu will appear on the left. Go to the Animation Tab on the left. 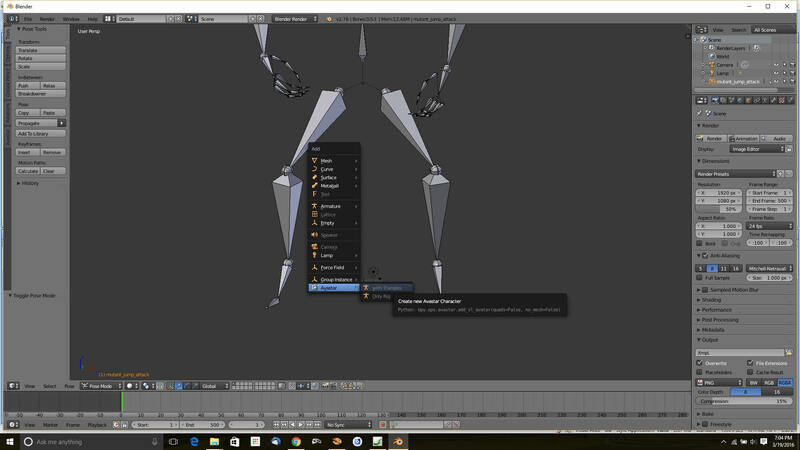 This menu appears when there is one Avastar and a second armature in the 3d window. The first 3 boxes should be already filled in. 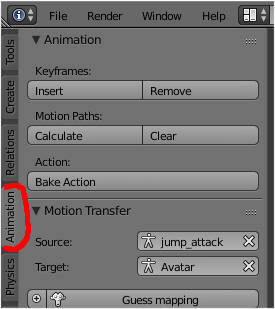 The first one has the name of the animation you are converting from, in my case "jump_attack". The second should have the name "Avatar". If they are backwards, you will need to reverse them so the copy goes from the BVH to the Avatar. 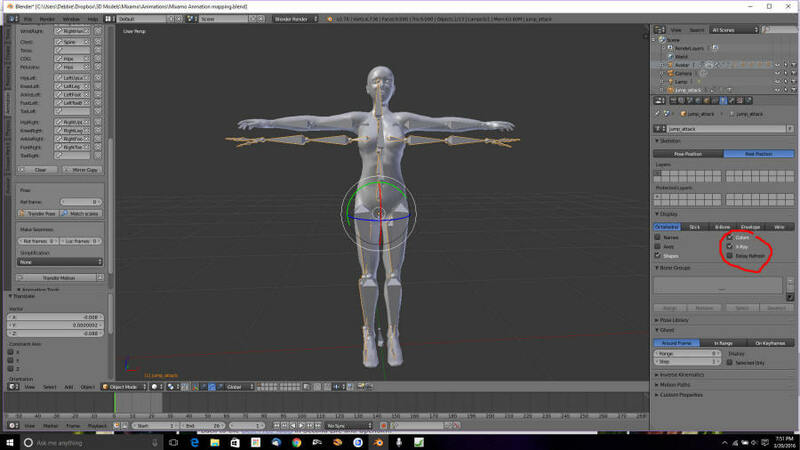 We will cover "Guess Map" soon, but first lets click the "Match Scale": button and see it shrink the BVH armature down in size. Avastar will usually fill in the Source and Target boxes. I ended up with this. Go ahead and position both of yours so they are in the same start position. They should both (more or less) line up now. Now click the X-ray and Names buttons on the Object Data window so we can see the bones. Now move the bones to match the Avastar. 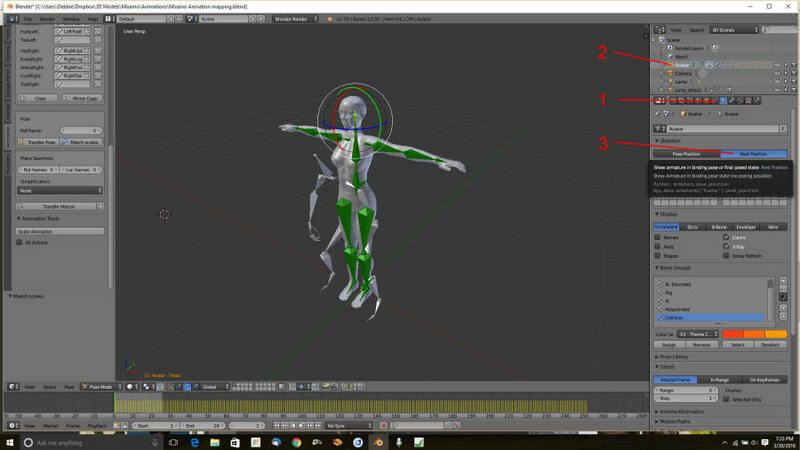 In my case, I used the B (box) key to draw a box around the upper part of the body, and then used G and Z keys to (G)rab it and move it upwards on the (Z) axis. Exit the Edit mode, and go into Pose mode. 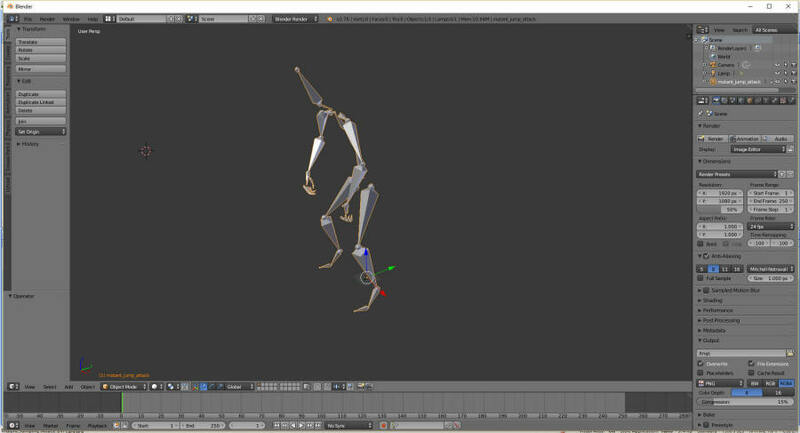 Hover the mouse over the 3-D window and press "A" several times until the BVH armature is glowing. 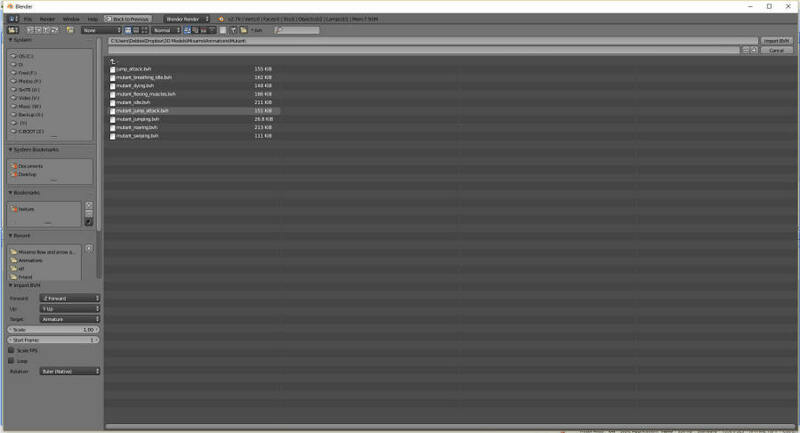 In the bottom window, you will see each frame of the animation lit in yellow. 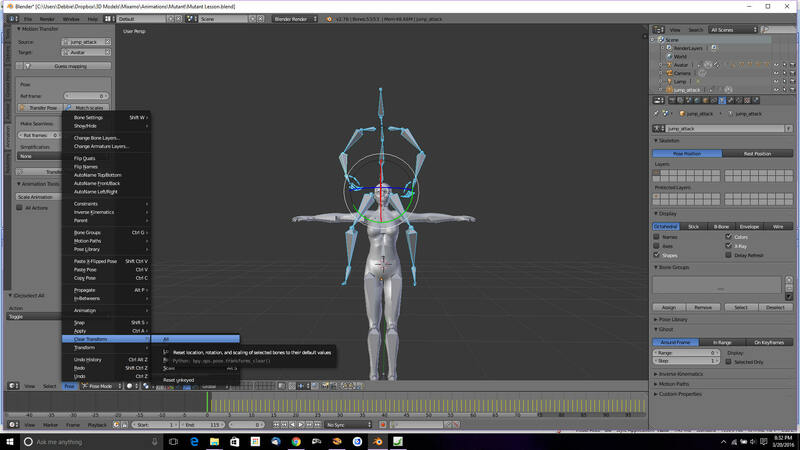 We are almost set to copy the animation from the Mixamo armature to the Second Life armature! 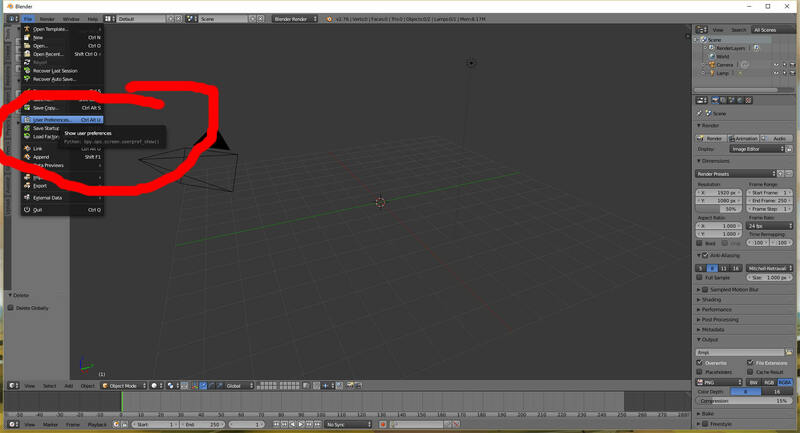 Move the green line by left clicking it to the Animation frame 0, You can also type in a zero. Any frame outside the animations can be used, but zero is typical. 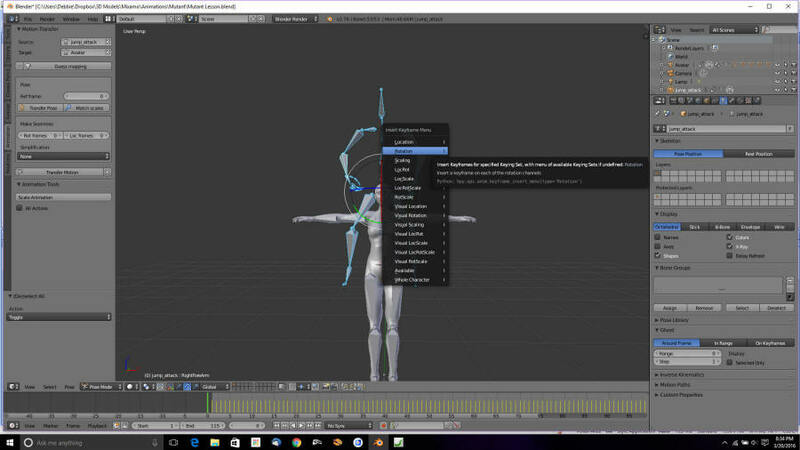 Press "I" while hovering over the 3-D windows to insert a Keyframe. It will prompt you for the type of recording to make. Select "Rotation". 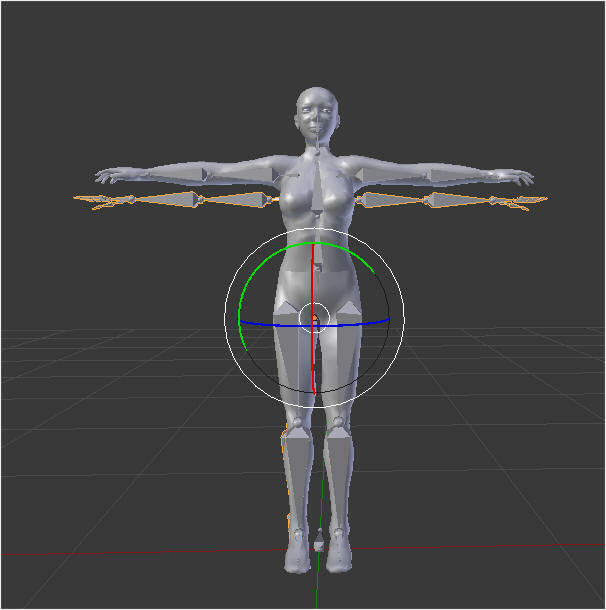 Now you have a T-pose keyframe at position zero. 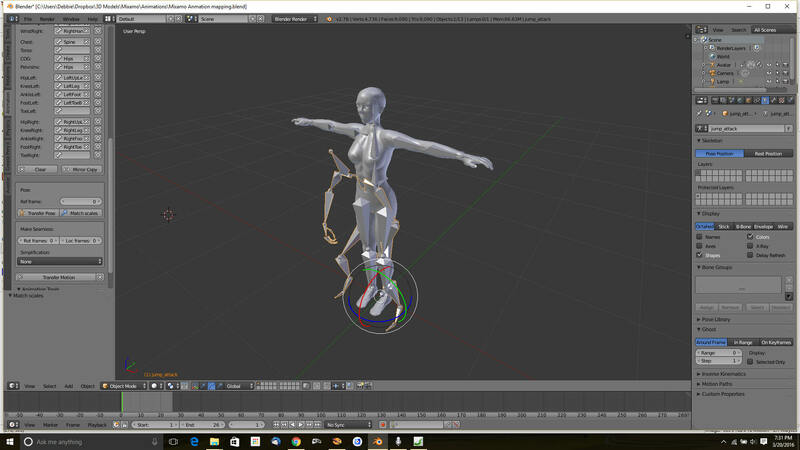 The BVH file does not match the Second life/Opensim armature. If it did, we would not have to go through all this mess. There is a button I mentioned earlier, "Guess Mapping". It's on the left, in the T windows. The to-from list normally does not include the foot bones. This is normal for Second Life armatures. Mixamo animations work fine with the guessed mapping. You can adjust these as necessary. Press Transfer Motion and wait a few seconds. Now click Play in the timeline. 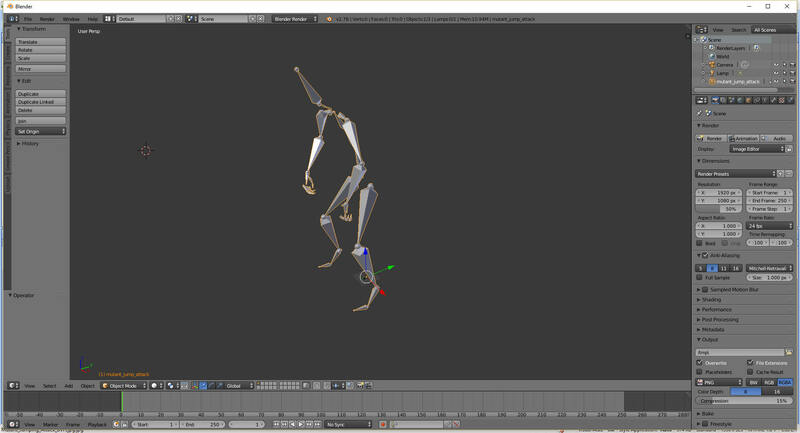 I have set the original BVH armature to hidden by right-clicking it and typing "H". You should be able to delete the original BVH armature now, load a new one, adjust the start and T-pose in a few more clicks and click Transfer to get another one ready to upload.